Keep Your Bracket Fever – It’s NHL Playoffs Time! 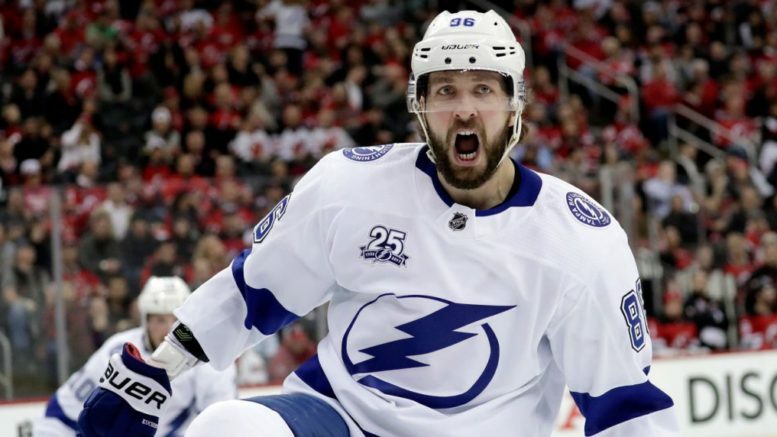 Nikita Kucherov, the likely Hart Trophy winner, looks to lead the Lightning to their first championship in 15 years. Tampa Bay is the overwhelming favorite entering the postseason. I’m so tempted to go upset here because Tampa Bay is the overwhelming favorite and, well, that hasn’t worked out well recently for teams like Duke, Alabama, the Astros, Saints. The team whose record the Lightning tied, the 1995-96 Red Wings, failed to reach the Stanley Cup Finals, and something tells me the Lightning may suffer the same fate. But alas, they are better than Columbus and their old coach, John Tortorella, who led them to their only championship in 2004. Columbus led the Caps 2-0 last year before dropping four straight and should give the Bolts a series. Pick: Lightning in 7. Oh, so the Leafs are back for more, eh? That’s what Boston fans must be saying, as the Leafs have come up short in Game 7 twice against the Bruins, in 2013 and 2018. This Bruins team is hot and mostly healthy and comes in tied for the second-most points in all of hockey, while the Leafs have been up and down at times. Toronto is young, talented, and fun to watch, but this Bruins team is loaded and deep and knows the window may not be open forever. It should be a good series again, but won’t go seven this time. Pick: Bruins in 6. The Caps open as a mere -140 favorite over Carolina, somewhat surprising given how hot they’ve been and that the Canes are pretty inexperienced as far as the playoffs go. But don’t sleep on another deep run by the defending champs, and Ovechkin and Co. getting all their skeletons out of the closet last year took a lot of pressure off of this franchise. Carolina is a scrappy team but doesn’t have enough firepower to hang with the Caps. Pick: Capitals in 6. So will all four blue bloods advance, or is there one upset in the bunch? I always pick the Penguins at this time of year, but it almost looks too obvious. I could see the Caps being the Metropolitan team that gets upset as well, but I’ll go with Crosby’s bunch just for the fun of it. Barry Trotz finally beat the Pens last year and despite the Isles being new to the scene, I’ll take the upset here. Pick: Islanders in 7. The Predators have been a safe bet in the first round and should have the advantage in this first-round matchup with Dallas. The Stars have a +8 goal differential, the lowest of any of the 16 playoff teams, and seem like the kind of team that the spotlight will be too bright for. Pick: Predators in 4. Remember when St. Louis had that 11-game winning streak way back when? I have a strange feeling that team is ready to emerge again in the playoffs, even against a Winnipeg team that had a great run getting to the conference finals last year. The Blues have never been to the Stanley Cup finals and loom as a great sleeper pick. Pick: Blues in 6. The Flames’ plus-62 goal differential was the best in the West by 34, trailing only the Lightning’s ridiculous plus-103 mark. Calgary looks ready to make a run in the West a year after limping to a fifth-place finish. First-year head coach Bill Peters has guided this team to the top of a strong conference and the Avalanche figure to be overmatched. Pick: Flames in 5. Quite possibly the best matchup and hardest one to pick, two recent conference winners square off in the first round. Do the Knights have some more magic in store? Or will the Shark Tank prove overwhelming? The Knights added several reinforcements this year, but neither team is playing well of late, with the Knights being 2-6 in their last eight and the Sharks 3-9 in their last 12. Something has to give, and I’ll go with the Sharks, if only because the Knights still might be glowing from last year’s epic run. Pick: Knights in 7. Be the first to comment on "Keep Your Bracket Fever – It’s NHL Playoffs Time!"